Who doesn't like to sip hot chocolate on those chilly mornings...and nights! It's one of my favorite pleasures when the weather starts to get cooler. So let's share our favorite hot chocolate brands and flavors. 3 individual packages of hot chocolate to each partner, make each one different! Include a short note in the package and be sure to include your Swap-bot name and the swap name. Make sure that directions for making the hot chocolate sachets are included if not printed on the envelopes, and please translate to English if it's printed in another language. This swap is open to all members in good standing of the Edibles Swappers International group. Please be kind in sending and thoughtful in receiving (rate and thank!). 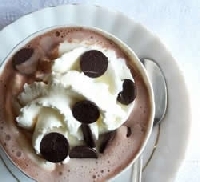 Enjoy your yummy hot chocolatey goodness! hmmm I think we have only one brand here in Norway hehehe... I will check the stores tomorrow or Saturday to see what we actually got here, and get back to this one, I will watch it so I dont forget! For those who would like to "double their fun", I'm running the same swap as a public swap HERE. Some of you have already found it, I see! ;-) The public swap requires 5 mailed/rated swaps and a 4.9 rating. Uhm, no, I found only one brand, one kind, just the one tasting cocoa... lol. I found some diet chocolate though, with different tastes, but I dont think it is so nice, I have tried them before hehe.